Time Series, Theoretical and Financial Econometrics, Statistics. Habilitation à Diriger des Recherches, Université Lille I, 1997. Ecole Nationale de la Statistique et de l'Administration Economique ENSAE, 1985. D.E.A., Applied Mathematics, Université Paris 9, 1985. Professor, Applied Mathematics, Université Lille III (2000-... on leave since 2007). Maître de Conférences, Applied mathematics, Université Lille I (1993-2000). Associate Editor for Econometric Theory (2012 - ). Guest Associate Editor for Annals of Computational and Financial Econometrics (2011-2015). Modèles GARCH - Structure, estimation et applications financières. 605 pages, with C. Francq. Consistent Pseudo-Maximum Likelihood Estimators and Groups of Transformations. Forthcoming in Econometrica, with C. Gouriéroux and A. Monfort, 2018. Estimation risk for the VaR of portfolios driven by semi-parametric multivariate models. Journal of Econometrics, 205, 381-401, with C. Francq, 2018. Goodness-of-fit tests for log-GARCH and EGARCH models. Test, 27, 27-51, with O. Wintenberger and C. Francq, 2018. Local explosion modelling by noncausal process. Journal of the Royal Statistical Society: Series B, 79, 737-756, with C. Gouriéroux, 2017. Estimating multivariate GARCH models equation by equation. Journal of the Royal Statistical Society: Series B, 2016, 78, 613-635, with C. Francq. Intrinsic liquidity in conditional volatility Models. Annals of Economics and Statistics, 123-124, 225-246, with S. Darolles, G. Lefol and C. Francq, 2016. Looking for efficient QML estimation of conditional VaRs at multiple risk levels. Annals of Economics and Statistics, 123-124, 9-28, with C. Francq, 2016. Variance targeting estimation of multivariate GARCH models, Journal of Financial Econometrics, 14, 353-382, with C. Francq and L. Horvath, 2016. Asymptotic inference in multiple-threshold double autoregressive models. Journal of Econometrics, 189, 415-427, with D. Li and S. Ling, 2015. On uniqueness of moving average representations of heavy-tailed stationary processes. Journal of Time Series Analysis, 36, 876-887, with C. Gouriéroux, 2015. Risk-parameter estimation in volatility models. Journal of Econometrics, 184, 158-173 with C. Francq, 2015. Comment on "Quasi-Maximum Likelihood Estimation of GARCH Models with Heavy Tailed Likelihoods" by J. Fan, L. Qi et D. Xiu. Journal of Business & Economic Statistics, 32, 198-201 with C. Francq, 2014. Multi-level conditional VaR estimation in dynamic models. In Modeling Dependence in Econometrics. Advances in Intelligent Systems and Computing Volume 251. Edts: V-N. Huynh et al., Springer, with C. Francq, 2014. Inference in non stationary asymmetric GARCH models. Annals of Statistics, 41:4, 70-98 with C. Francq, 2013. GARCH models without positivity constraints: Exponential or Log GARCH? Journal of Econometrics, 177, 34-46 with C. Francq and O. Wintenberger, 2013. Estimating the Marginal Law of a Time Series with Applications to Heavy Tailed Distributions. Journal of Business and Economic Statistics, 31:4, 412-425 with C. Francq, 2013. Estimation adjusted VaR. Econometric Theory, 735-770 with C. Gouriéroux, 2013. Strict stationarity testing and estimation of explosive and stationary GARCH models. Econometrica, 821-861, with C. Francq, 2012. QML estimation of a class of multivariate asymmetric GARCH models. Econometric Theory, 28, 179-206, with C. Francq, 2012. Two-stage non Gaussian QML estimation of GARCH Models and testing the efficiency of the Gaussian QMLE. Journal of Econometrics, 165, 246-257, with C. Francq and G. Lepage, 2011. Merits and drawbacks of variance targeting in GARCH Models. Journal of Financial Econometrics, 9, 619-656, with C. Francq and L. Horvath, 2011. A conditionally heteroskedastic model with time-varying coefficients for daily gas spot prices. Energy Economics, 33, 1240-1251, with N. Regnard, 2011. Asymptotic properties of LS and QML estimators for a class of nonlinear GARCH processes. Journal of Statistical Planning and Inference, 141, 488-507, with T. Hamadeh, 2011. Combining nonparametric and optimal linear time series predictions. Journal of the American Statistical Association, 105, 1554-1565, with S. Dabo and C. Francq, 2010. Inconsistency of the MLE and inference based on weighted LS for LARCH models. Journal of Econometrics, 159, 151-165, with C. Francq, 2010. Structure and estimation of a class of nonstationary yet non explosive GARCH models. Journal of Time Series Analysis, 31, 348-364, with N.Regnard, 2010. Sup-tests for linearity in a general nonlinear AR(1) model. Econometric Theory, 26, 965-993, with C. Francq and L. Horvath, 2010. Testing the nullity of GARCH coefficients : correction of the standard tests and relative efficiency comparisons. Journal of the American Statistical Association, 104, 313-324, with C. Francq, 2009. Bartlett's formula for a general class of nonlinear processes. Journal of Time Series Analysis, 30, 449-465, with C. Francq, 2009. Estimating ARCH Models When the Coefficients are Allowed to be Equal to Zero. Austrian Journal of Statistics, 37, 31--40, with C. Francq, 2008. Deriving the autocovariances of powers of Markov-switching GARCH models, with applications to statistical inference. Computational Statistics and Data Analysis, 52, 3027--3046, with C. Francq, 2008. A tour in the asymptotic theory of GARCH estimation. Handbook of Financial Time Series, Edts: T. G. Andersen, R.A. Davis, J-P. Kreiss, T. Mikosch, Springer Statistics, with C. Francq, 2009. A class of stochastic unit-root bilinear processes. Mixing properties and unit-root test. Journal of Econometrics, 142, 312-326, with C. Francq and S. Makarova, 2007. Quasi-Maximum Likelihood in GARCH processes when some coefficients are equal to zero. Stochastic Processes and their Applications, 117, 1265-1284, with C. Francq, 2007. HAC estimation and strong linearity testing in weak ARMA models, (extended version here) Journal of Multivariate Analysis, 98, 114-144, with C. Francq, 2007. Stationarity and geometric ergodicity of a class of non-linear ARCH models. Annals of Applied Probability, 16, 2256-2271, with Y. Saïdi, 2007. Linear-representation based estimation of stochastic volatility models. Scandinavian Journal of Statistics, 33, 785-806, with C. Francq, 2006. Mixing properties of a general class of GARCH(1,1) models without moment assumptions on the observed process. Econometric Theory, 22, 815-834, with C. Francq, 2006. 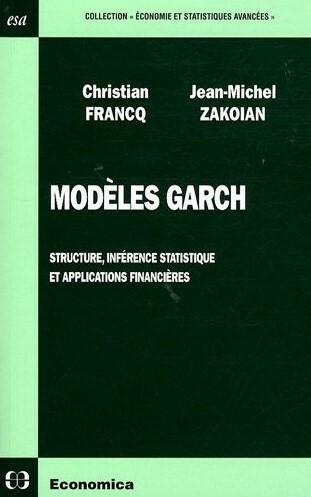 On Efficient Inference in GARCH Processes, in Dependence in Probability and Statistics, 305-327, Springer, edited by P. Bertail, P. Doukhan et P. Soulier, with C. Francq, 2006. The L2-Structures of Standard and Switching-regime GARCH models, Stochastic Processes and their Applications, 115, 1557-1582, with C. Francq, 2005. A central limit theorem for mixing triangular arrays of variables whose dependence is allowed to grow with the sample size. Econometric Theory, 21, 1165-1171, with C. Francq, 2005. Diagnostic checking in ARMA models with uncorrelated errors. Journal of the American Statistical Association, 13, 532-544, with C. Francq and R. Roy, 2005. Recent Results for Linear Time Series Models with Non Independent Innovations. In Statistical Modeling and Analysis for Complex Data Problems, P. Duchesne and B. Rémillard Editors, Springer, with C. Francq, 2005. Maximum Likelihood Estimation of Pure GARCH and ARMA-GARCH Processes. Bernoulli, 10, 605-637, with C. Francq, 2004. Autocovariance Structure of Powers of Switching-regime ARMA Processes. ESAIM:Probability and Statistics, 6, 259-270, with C. Francq, 2003. Comments on the paper by Minxian Yang: "Some Properties of Vector Autoregressive Processes with Markov-Switching Coefficients". Econometric Theory, 18, 815-818, with C. Francq, 2002. Efficient Use of High Order Autocorrelations for Estimating Autoregressive Processes. Journal of Time Series Analysis, 23, 287-312, with C. Francq and L. Broze, 2002. Stationarity of Multivariate Markov-switching ARMA Models, Journal of Econometrics, 102, 339-364, with C. Francq, 2001. Non Redundancy of High Order Moment Conditions for Efficient GMM Estimation of Weak AR Processes, Economic Letters, 71, 317-322, with C. Francq and L. Broze, 2001. Contemporaneous Asymmetry in GARCH Processes. Journal of Econometrics, 101, 257-294, with M. El Babsiri, 2001. Conditional Heteroskedasticity Driven by Hidden Markov Chains. Journal of Time Series Analysis, 22, 197-220, with C. Francq and M. Roussignol, 2001. Stationnarité des modèles ARMA avec changement de régime markovien. C.R.A.S., 330, 1031-1034, with C. Francq, 2000. Modèles ARCH avec changement de régime markovien. C.R.A.S., 330, 921-924, with C. Francq and M. Roussignol, 2000. Estimating Weak GARCH Representations. Econometric Theory, 16, 692-728, with C. Francq, 2000. Multivariate ARMA Models with Generalized Autoregressive Linear Innovation. Stochastic Analysis and Applications, Vol. 18 n°2, 231-260, with C. Francq, 2000. Covariance Matrix Estimation for Estimators of Mixing Weak ARMA Models. Journal of Statistical Planning and Inference, 83, 369-394, with C. Francq, 2000. Estimation de représentations GARCH faibles. C.R.A.S., 326, 495-498, with C. Francq, 1998. Estimation de la précision asymptotique dans l'estimation de modèles ARMA faibles. C.R.A.S., 326, 377-380, with C. Francq, 1998. Estimating Linear Representations of Nonlinear Processes. Journal of Statistical Planning and Inference, 68, 145-165, with C. Francq, 1997. Quasi Indirect Inference for Diffusion Processes. Econometric Theory, 14, 161-186, with L. Broze and O. Scaillet, 1997. Estimation de la structure par terme des taux d'intérêt. Revue Economique, 47, 511-519, with L. Broze and O. Scaillet, 1996. Estimation de représentations ARMA faibles sous hypothèses de mélange. Comptes Rendus de l'Académie des Sciences (C.R.A.S. ), 323, 297-300, with C. Francq, 1996. Testing for Continuous Time Models of the Short Term Interest Rate. Journal of Empirical Finance, 2, 199-223, with L. Broze and O. Scaillet, 1995. Modèles autorégressifs à seuils mutiples. Annales d'économie et de statistique, 36, 23-56, 1994. Estimation d'équations de diffusion à partir d'observations discrètes et de méthodes fondées sur des simulations. Cahiers du Centre d'Etude de Recherche Opérationnelle, 36, 43-55, with L. Broze and O. Scaillet, 1994. Threshold Heteroskedastic Models. Journal of Economic Dynamic and Control, 18, 931-955, 1994. Threshold ARCH models and asymmetries in volatility. Journal of Applied Econometrics, 8, 31-49, with R. Rabemananjara, 1993. Les Modèles ARCH: une revue de la littérature. Journal de la Société Statistique de Paris, 40-57, 1992. 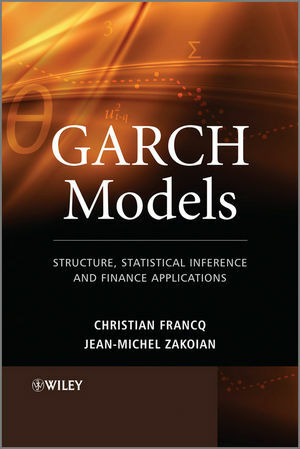 GARCH and Stochastic Volatility Models, Stochastic Processes. Functional GARCH models: the quasi-likelihood approach and its applications, with C.
Hörmann and C. Francq, 2018. Mixed Causal-Noncausal AR Processes and the Modelling of Explosive Bubbles, with S. Fries, 2017. Pseudo-maximum likelihood and Lie groups of linear transformations, with C. Gouriéroux and A. Monfort, 2017. Virtual Historical Simulation for estimating the conditional VaR of large portfolios, with C. Francq, 2018. Linear-Representations Based Esimation of Switching-Regime GARCH Models, Document de travail du CREST N° 99-57, with C. Francq. Efficient Use of High Order Autocorrelations for Estimating Autoregressive Processes, Document de travail du CREST N° 99-56, with L. Broze and C. Francq. Estimating stochastic volatility models: a new approach based on ARMA representations, Document de travail du CREST N° 2000-47, with C. Francq, ps file. The L2 Structures of Standard and Switching-Regime GARCH Models, with C. Francq, ps file. L2 Structures of Standard and Switching-Regime GARCH Models and their Implications for Statistical Inference, with C. Francq, ps file. Goodness-of-fit tests for ARMA models with uncorrelated errors, with C.Francq and R. Roy, ps file. HAC estimation and strong linearity testing in weak ARMA models, with C. Francq, ps file. Estimating and testing GARCH processes when the parameter is on the boundary, with C. Francq, pdf file.